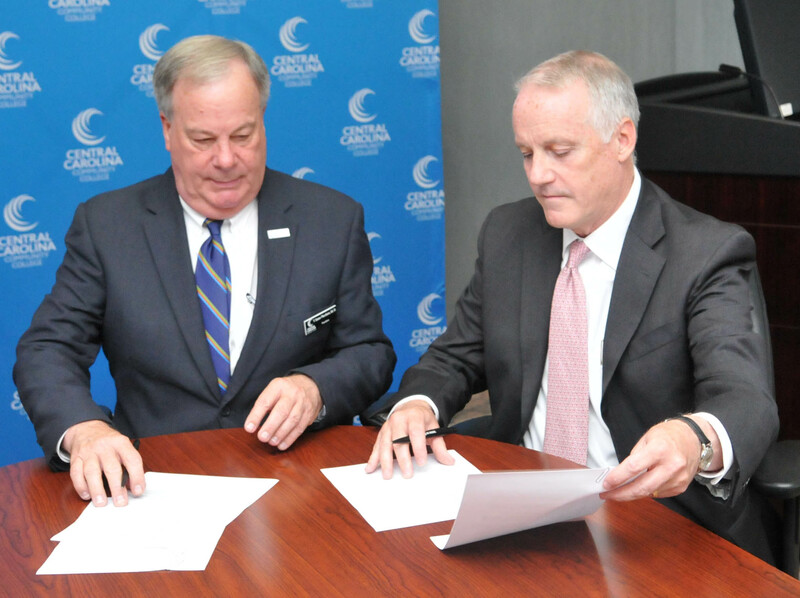 SANFORD - Central Carolina Community College and NC State University have signed a Memorandum of Understanding that promotes both associate degree and baccalaureate degree completion by giving guaranteed admission to NC State for CCCC students who meet the conditions of the program. The NC State University Strategic Plan outlines an initiative to develop alternative pathways for admission to NC State through the North Carolina Community College System. Additionally, long-range enrollment goals include increased enrollments of transfer students, as well as increased enrollments of rural and low-to-moderate income students. The NC State Community College Collaboration (NC State C3) promotes achievement of these goals and initiatives by offering a transfer pathway for rural and low-to-moderate income students while promoting baccalaureate degree completion and fulfilling NC State's land-grant mission for the citizens of North Carolina. "Central Carolina Community College is thrilled to be partnering with N.C. State University on this initial offering of the NC State Community College Collaboration program," said CCCC President Dr. T. Eston Marchant. "This program provides excellent advising and program support for low-to-moderate income students by combining the efforts and resources of CCCC and NC State and creating a more seamless transfer experience. The C3 program will be an outstanding attraction for our students who are considering NC State for part of their higher education experience." Dr. Louis D. Hunt, Senior Vice Provost for Enrollment Management at NC State University, noted, "We're very excited about this partnership. As a land-grant institution, we've always been committed to providing opportunities to all citizens across the state of North Carolina. Creating more opportunities for students from low-to-moderate income families and students from rural communities is essential to our success. NC State's strategic plan emphasizes increasing the number of North Carolina Community College System graduates enrolling in our programs." NC State and CCCC will work together to promote greater access to NC State through improved, collaborative advising. CCCC students will be dually-enrolled at NC State and receive access to advising, financial aid, and other resources to facilitate a smooth transfer to the university. CCCC students who are accepted into the program and meet the C3 criteria are guaranteed admission to NC State on the completion of their Associate in Science, Associate in Arts, or Associate in Engineering degrees. NC State C3 is a dual-admission program between N.C. State and eight regional community college partners: Alamance Community College, Central Carolina Community College, Durham Technical Community College, Johnston Community College, Nash Community College, Vance-Granville Community College, Wake Technical Community College, and Wilson Community College. "On behalf of our students, we are delighted to partner with N.C. State in this new transfer initiative," said Dr. Lora L. Witcher, CCCC Biology Instructor who is program liaison. "As a direct result of this program, CCCC students will have increased opportunities toward completion of their bachelor's degree. While participating in the C3 program, students will benefit from academic and financial aid advising at both institutions, as well as having the prospect of getting to know NC State's campus prior to making the transition. We are excited to be in on the ground floor of NC State's C3 program." Up to 3 years from date of acceptance to the C3 program to complete the Associate of Arts, Associate of Science, or Associate of Engineering at Central Carolina Community College. Dual admission to NC State University as a Non-Degree Studies (NDS) student. Access to NC State services consistent with Non-Degree Studies enrollment (some services are fee-based and will be unavailable to C3 students). Access to academic advising by designated advisors at Central Carolina Community College and NC State to ensure students select courses to minimize their time to degree completion and optimize academic achievement. Access to the NC State degree planning and degree audit tools. Access to financial aid advising and planning to aid students in maximizing their aid and minimizing student debt. Invitation to specialized C3 program events designed to aid students with their connections to NC State and their timely and successful completion of their associate and baccalaureate degrees. Admission into an NC State undergraduate degree program upon completion of the AA, AS, or AE degree and continuous maintenance of a 3.0 on a 4.0 scale (Note: students are not guaranteed admission into a particular major, as high demand programs may be more competitive.). Eligibility for scholarships and financial aid, subject to financial aid eligibility. Invitation to specialized C3 program events designed to aid students with their transition to NC State and with their timely and successful completion of their baccalaureate degree. For more information about the NC State C3 program, visit the website: go.ncsu.edu/transferc3.